Świebodzice ([ɕfjɛbɔˈd͡ʑit͡sɛ]; German: Freiburg) is a town in south-western Poland with 23,175 inhabitants (as of 2014[update]). It is situated in Świdnica County, Lower Silesian Voivodeship (from 1975–1998 it was in the former Wałbrzych Voivodeship). The town is situated close to Książ Castle, which during World War II, together with the cave complex, was expanded to create private quarters for Adolf Hitler. Prior to 1945 the town was in Germany and known as Freiburg in Schlesien. After World War II the region was placed under Polish administration by the Potsdam Agreement. Most Germans fled or were expelled and new Polish settler, some of whom had been expelled from Eastern Poland, took their place and property. 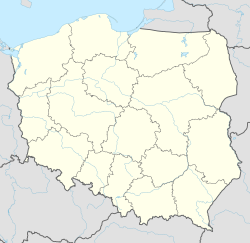 The town's name was changed to a new, Polish name to replace the original German name. Old fortifications from around 1279, the year the town was founded, still remain. Emil Krebs (1867–1930), German scientist, noted polyglot who spoke a total of 68 languages at the time of his death. Anna Zalewska, (born 1965) politician, Minister of National Education of Poland. Wikimedia Commons has media related to Świebodzice. This Świdnica County location article is a stub. You can help Wikipedia by expanding it. This page was last edited on 13 April 2019, at 20:56 (UTC).